The Wilbert Paige Memorial Tournament was held in July 2001 and stands as an event of tremendous historic significance. 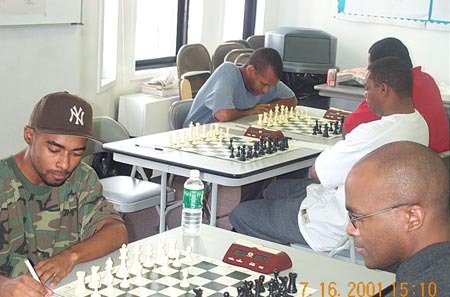 The tournament featured ten of the world's top players of African descent. It was held at the Theresa Hotel off of 125th street in historic Harlem, home of the Apollo theatre and the "Harlem Renaissance." Perhaps the tournament was a a type of a renaissance as many spectators came to watch the games and to see history in the making. In round three, two fine players were paired: FM Kenny Solomon, a tenacious fighter from South Africa and IM Michael Schleifer, an attacking player from Canada. Both players were not well known in the U.S., but after the tournament ended both were the subject of many conversations. Schleifer tied for 2nd place with IM Watu Kobese behind the winner, FM Stephen Muhammad who also got his 1st IM norm. Solomon scored a respectable 5-4 and his nine games averaged a total of 62 moves (included a 91-move draw with Kobese)! In fact, this game would be one of his shortest. IM Schleifer used his spatial advantage and capitalized on weakening moves by the young South African and efficiently wrapped up the point. The game was annotated by IM Schleifer for inclusion into the Wilbert Paige Memorial booklet. FM Kenny Solomon (bottom left) facing IM Michael Schleifer (bottom right). FM Stephen Muhammad faces NM Norman Rogers while FM William Morrison waits on Uganda's NM Grace Nsubuga. Photo by Daaim Shabazz.